“Big Data” has been on corporate radar screens for years now. Unfortunately, outside of the data scientists and statisticians who spend their days immersed in truly complex datasets, both end users and key decision makers often struggle to make sense of the data their organizations collect and generate. Whether an organization’s data is really “big” is even a topic of debate. Characterizing a company’s data, though, can’t simply be dismissed as a matter of semantics. It frequently falls on IT to provide appropriate analytics solutions for heterogeneous users with a wide range of skill sets, job descriptions, and analytical needs, whether the data being analyzed is truly unstructured, web-scale data or just too many spreadsheets. Regardless of the type or scale of data your users need to harness and analyze, they need a straightforward, visual solution that is easy to use on the front end and highly scalable on the back end. 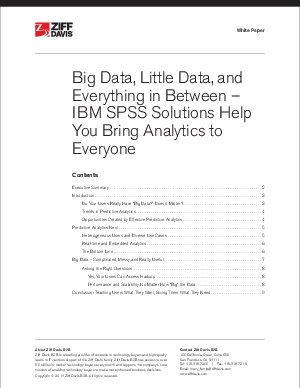 Fortunately, IBM SPSS Modeler, SPSS Analytical Server, and SPSS Analytical Catalyst provide just such an ecosystem that can make different kinds of data stores, from Hadoop to those proverbial spreadsheets, useful sources of business insight and decision support.